How to Tell If an Autographed Baseball Is Not a Stamp? 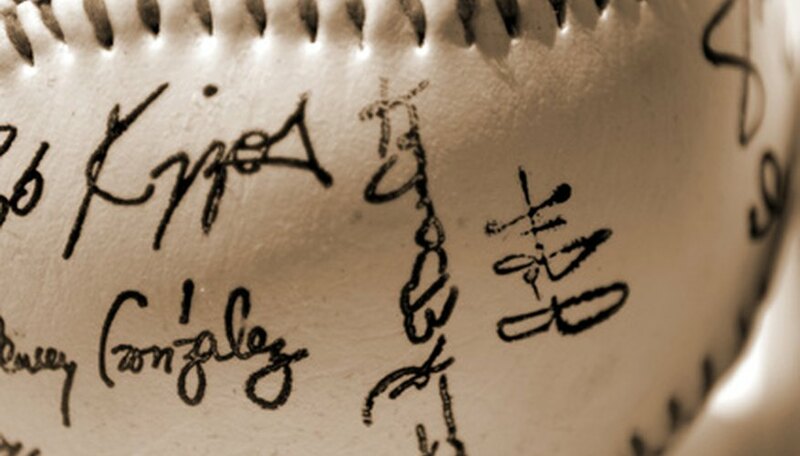 Before you purchase an autographed baseball, it's important to know if the ball was stamped or authentically signed. Stamped baseballs are produced in bulk by a manufacturer using a facsimile or sample signature. When you buy a stamped ball, you are buying something created by a machine rather than a collectible signed by your favorite player. In contrast, real autographed baseballs are individually signed in pen by the athlete, and each signature is unique. Because of this, stamped and pre-printed baseballs are worth much less than authentic autographed baseballs. Research the player to determine the approximate age of the baseball. For example, if you have a baseball signed by Thurman Munson, it's important to know that he died in 1979. Any authentic signature from Munson is more than 30 years old. Examine the baseball and the signature for signs of wear. Older signatures will fade over time and authentic older baseballs are almost always discolored from age. Rub your finger carefully over the signature. Feel for grooves caused by pen pressure. Stamped signatures are flat and smooth. Hold the baseball under a lamp and tilt it. Watch how the light reflects off the signature. Real ink signatures reflect light inconsistently and in different colors, whereas pre-printed signatures will appear glossy and uniform. Use a magnifying glass to study the signature. Real ink has rough edges and trails off at the end of a stroke. By comparison, stamped signatures have consistent, sharp edges. Compare the signature with other authentic signatures from that player. Pay attention to characters and pen strokes that are the same in different samples and verify that your autographed baseball has these characteristics. Submit your baseball to a professional authentication service like PSA/DNA or JSA. For a fee, these companies will determine if the signature is a real autograph and whether it is authentic. If your autographed baseball is certified authentic, this will raise its value. Research the item to see if there are others similar to yours. For example, you may find that a certain baseball is, in fact, a mass-produced stadium giveaway item. Learning as much as you can about autographs will help you authenticate many different items. Find out when certain pens were manufactured, learn about the materials used to make baseballs in different time periods and talk to other collectors about players' signing habits. This information will come in handy when you are authenticating any item, including autographed baseballs. Research your item thoroughly before advertising it as an authentic autograph. Sharon Hadrian has been a freelance writer since 2004. She has written articles for MTV, RealSelf and the "Salt Lake Metro," in addition to ghostwriting for clients around the world. Hadrian has an Associate of Arts in English from the Community College of Baltimore County.